Literary disquisitions on a fundamental feature of urban life: the public square. Red Square, Tiananmen Square, Tahrir Square: these are the places around which history has been made. 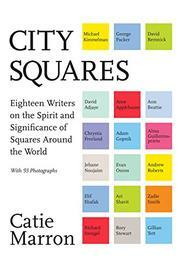 However, writes Michael Kimmelman in this companion to chief editor Marron’s City Parks, such squares are, well, “rarely square”: they may be oval, round, roughly parallelogrammatic, or even free form; when they are square, such as Madrid’s Plaza Mayor, sometimes not a lot of note happens on them for large stretches of time. This handsome little book belongs on urban-studies bookshelves for many reasons, foremost of them the photographs. Together, the dozens of images make a grand testimonial to how people live their lives in public spaces, some of which have been public spaces for thousands of years, others of which are relatively new, the creation of urban planners or accidents of history. In this regard, British writer and diplomat Rory Stewart writes meaningfully of a forlorn space in Kabul, “layered like a mille-feuille cake with bright blue bags and sprinkled with the feces of men and goats,” unlikely to become the tourist destination that the Place des Vosges of Paris has recently transformed into, a place, New Yorker writer Adam Gopnik memorably notes, in which “to buy an overpriced lunch in cafés filled with waiters who speak some weary bad-tempered English or German.” Some of the authors, such as Elif Shafak, who writes of Istanbul, and Alma Guillermoprieto, who portrays the Zócalo of Mexico City, should be better known to American readers; others, such as Gopnik and Zadie Smith, are a little overexposed, and Smith’s essay in particular seems tossed-off. Most of the contributions, however, are thoughtful and sometimes even surprising, and if they don’t always make you want to visit the places in question—Kabul comes to mind—they lend an appreciation for the depth of history surrounding them.